So my first Fringe Festival came to a close yesterday, and I have to say, I want more. And after seeing some amazing pieces of work over the past week and a half, a few of which walked away with awards, I don’t think I could have chosen anything better to end my first Fringe experience with than High Tea. After bumping into both cast members, James and Jamesy, in various lines throughout the festival, and promising them, each time, that I had my ticket for their final Sunday performance, I finally settled in to watch it. From the off, you knew this was going to be something fun and unique… they supplied the line with a good cuppa while they waited to get into the Randolph Theatre. 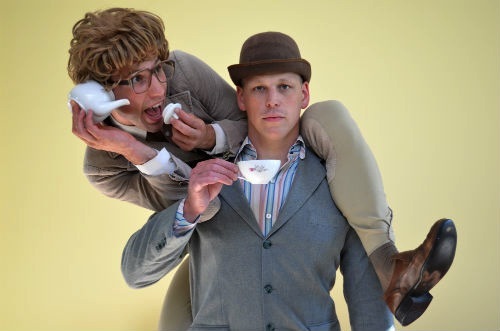 Filled with physical comedy and brilliant moments, James and Jamesy take the audience in a fully participatory event that sees the world submerged under tea, how wonderfully British. Jamesy feels like a cross between John Cleese and Jerry Lewis, there is a physicality to everything he does, almost balletic movements that send the audience into riotous laughter, but it’s through the performance of, mostly straight man, James, that the audience is truly pulled in. There was gentle chuckling and applause as the performance got under way, but shortly into the far too short 60 minute run time, the entire audience was completely involved in the event – this personified audience participation, but everyone was so into the moment, that folks practically leapt at the opportunity to play with these two. And they definitely came to play. The sheer joy, and imagination that they brought to their show was unparalleled in anything else I saw at Fringe this year, it was exuberant, laugh out loud funny, while being completely, inherently British. Playing off one another (and there were times when James seemed to be having such a great time that he almost got caught up in the laughter himself), these two had the audience completely in their hands, as they try to survive on the last piece of earth on Earth, celebrate the Queen, and pay a fantastic nod to Titanic. The creativity and wonder that these two shared with their audience in each performance was an absolute joy to be a part of, and I cannot wait for their next return to Toronto, because I’ll be there. And Fringe Festival… I’ll be seeing you next year! Previous Post The Thing (2011) – Matthijs van Heijningen jr.